Custom Cedar Privacy Fence in Saugatuck, Michigan. Our custom wood fence offerings were designed to be the perfect natural accent to your garden, yard, or property space. With a substantial variety of options, we thought it may be helpful to give you a guide, of sorts, to help when making decisions about your new custom wood fence. We hope this design guide provides information on how to create a great fence design which reflects the architectural look of your home and meets your needs for privacy and functionality. Your fence or privacy screening should harmonize with the style of your garden landscaping, as well as the look and feel of your home. But the most important thing to consider is what your enclosed space will be used for primarily. Is it an outdoor playground for the kids? An entertainment area for friends? A barbecuer’s dreamlab? A splashy, noisy pool area? 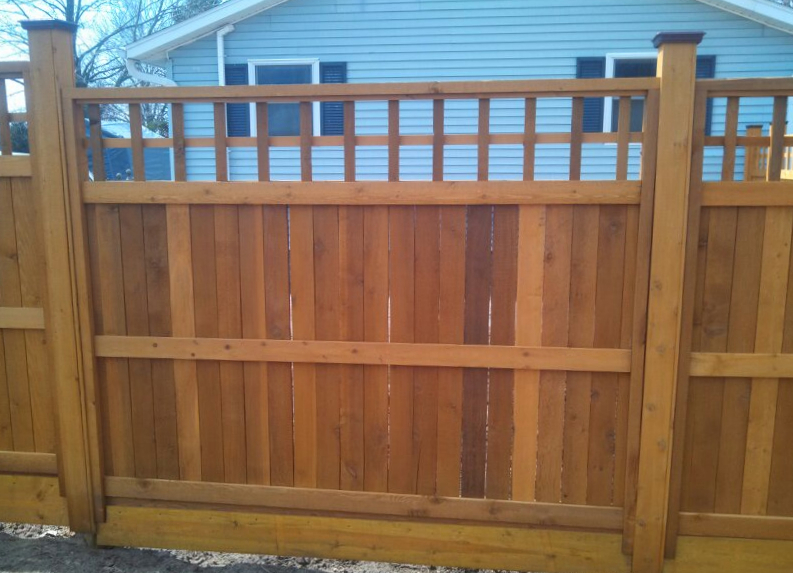 There are obviously many different types of wood fencing that will fulfill a multitude of functionality goals, including good neighbor ‘best practices”. But when it comes to custom fence design, we’re not just talking about matching styles, we’re talking about creating environments. 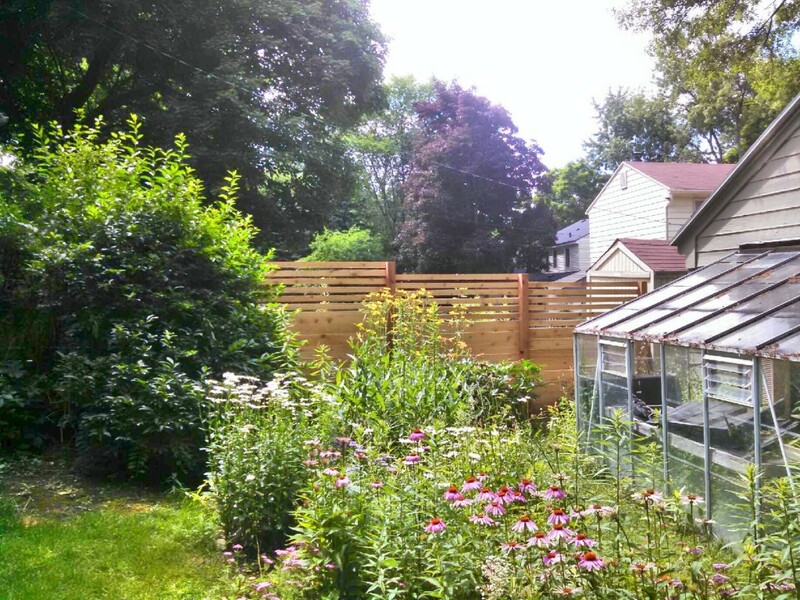 What environment will you foster with your wood fence? You could consider using the final color of your fence to complement the colors used in your landscaping. If you want your fence to blend into the landscaping, the natural color of the wood or browns and greens work well. Strong colors like white or black can be used to highlight plant life against their stark background. Using the same color and trim details on the fence or screening as on your home can often give your property a distinguished look. Consider the overall property and how it will appear with a wood fence. It will matter to how you experience the fence and the space it’s enclosing, but it will also matter to potential home buyers, should you decide to sell. Neighbors & Your Property Line ~ What it means to be a good neighbor is different depending on where you live. If you reside in a housing development neighborhood, where houses often share visible property lines, it may be a kindness to share your plans to build a fence as well as the style, height, orientation (of the good and bad side) and finish of the proposed fence (Some housing developments and condo associations require this, or may even have restrictions). If you live out in the country and the distance between you and your neighbors is pretty big, it may not be necessary to let them know you’re installing a fence. Nevertheless, no matter where you live, YOU MUST verify your OFFICIAL property line, work out construction access, and deal with pet containment (yours and neighbors). View ~ A wood fence often provides a natural way to obscure the view of the surrounding neighborhood – both in and out. Consider what you do and don’t want to see, both walking around and sitting. Framed openings can often be installed to accent focal points that you want to retain. Wind ~ While custom fencing is a great way to protect yourself from prevailing winds; in areas that experience high winds, a more open design, extra bracing, and heavy duty hardware may be needed. Water ~ Excessive moisture (from rain, hosing down, sprinklers and deep shade) can lead to premature aging and structural decay. Your custom wood fence structure should be designed to shed rain and dew readily and have good drainage away from site, leaving no standing puddles. Plants ~ For a longer life of your wood fence, ivy and heavy vines should be kept off the fence with a climbing trellis mounted in front to minimize contact with the actual structure. Custom Built Cedar Horizontal Privacy Fence in East Grand Rapids, Michigan. Materials ~ To maximize the life expectancy, the frame should be made of pressure treated lumber set in steel column bases. The posts and fence boards can be made from a variety of woods. Better wood grades and thicker fence boards and beams lengthen the life expectancy of your project. Finishes ~ For the longest lasting wood fence applications, it would be wise to include a finish to your fence. In addition to wind & rain, heat & light also contribute significantly to weathering, so a UV protective finish is important. Stains (clear, tinted, or solid) and paint are popular finish choices and work well, though differently, with different types of materials. Accessories & Built-ins ~ The type of trim, moldings, lattice, post caps, finials and other custom fence detailing will add to the uniqueness of your fence. But adding accessories can ALSO enhance your fence’s functionality. Built-ins such as benches, privacy nooks, plant containers and shelves, vine trellises, lanterns, and other lighting can all add an element of accent that is unique to your custom fence. Metalwork ~ Hardware like handles, hinges, and bolting can be a valuable way to beef up the longevity of your fence, but pick the right ones, and they can bring personality to your wood fence. Accents, such as copper post caps or blackened iron joining straps, can enhance the appearance of your fence as well. Lighting ~ Spending time around your fence at night? The choice of lighting style and fixtures, such as lanterns hung from posts, mounted sconces, or spot lighting can create an immediate sense of dramatic style – in addition to providing a valuable safety feature and extending the enjoyment of your enclosed space. To make sure you are delighted with your custom fence or privacy screen — you want to choose the right building material. In Grand Rapids, the popular wood choices allow you to make tradeoffs in terms of cost, quality, color, visual appearance, ease of maintenance and the ability to resist the elements (water, sun and pests). There are several popular choices for fence boards. However, Cedar is known around the country as the best wood to use for your home’s fencing needs. It is naturally resistant to rotting, won’t decay, and is environmentally friendly. It requires little to no maintenance, and can often last a lifetime. Cedar ages beautifully, which is ideal for blending in to your landscaping. 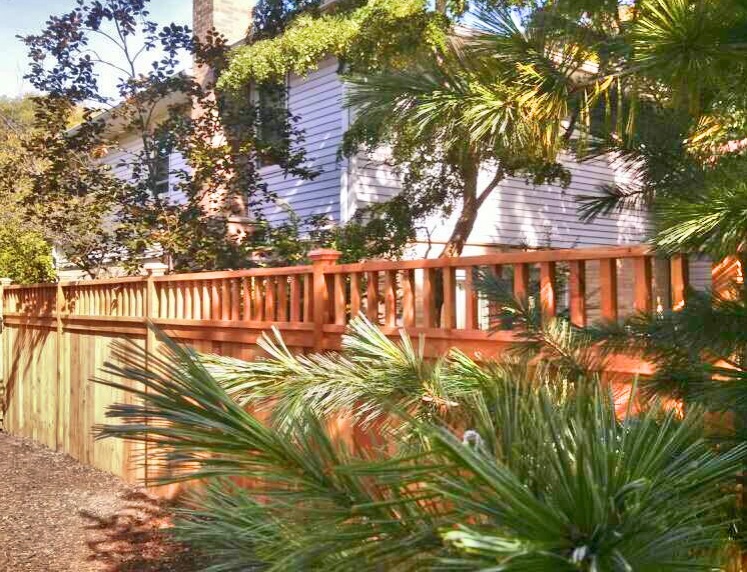 Our Custom wood fences are symmetrically built board by board on site – so we can truly customize your fencing to the natural undulation of your property. A custom wood fence done right can expand the beauty of any property and last forever, so it is important to us that our professionals provide precision installation and master craftsmanship every time. Commercial Aluminum Fence Around Outdoor Seating Area Vinyl or Aluminum?